A first-of-its-kind study published in the scientific journal Climatic Change links global climate changes to specific fossil fuel producers. Emissions traced to the 90 largest carbon producers contributed approximately 57% of the observed rise in atmospheric CO2, nearly 50% of the rise in global average temperature, and around 30% of global sea level rise since 1880. Emissions linked to 50 carbon producers, including BP, Chevron, ConocoPhillips, ExxonMobil, Peabody, Shell and Total, were responsible for roughly 16% of the global average temperature increase from 1880 to 2010, and around 11% of the global sea level rise during the same time frame. Emissions tied to the same 50 companies from 1980 to 2010, a time when fossil fuel companies were aware their products were causing global warming, contributed approximately 10% of the global average temperature increase and about 4% sea level rise. 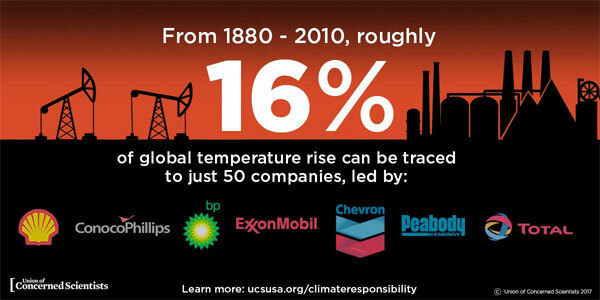 Emissions traced to 31 majority state-owned companies, including Coal India, Gazprom, Kuwait Petroleum, Pemex, Petroleos de Venezuela, National Iranian Oil Company and Saudi Aramco, were responsible for about 15% of the global temperature increase and approximately 7% of the sea level rise between 1880 and 2010.